Hi, my name is Michelle Stewart and I am the creator and author of BodhranExpert.I have personally taught well over a thousand people how to play this amazingly addictive instrument and I get to teach it all over the world. I have learned the most from teaching itself. I am constantly trying to figure out the fastest, easiest and most fun way to teach drumming. I want to use my creativity and enthusiasm to teach and inspire others to freely express their talents in a fun and empowering way. I currently teach bodhran to young, up and coming traditional musicians through the Royal Scottish Academy of Music and Drama’s MusicWorks Program http://www.rsamd.com. 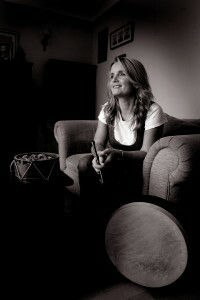 In 1997 I was asked to test the waters with a bodhran workshop at the Gaelic College http://www.gaeliccollege.edu. The course was so overwhelmingly popular that bodhran was made a full discipline the following year. After taking an intense week’s course at summer schools like the Gaelic College my students would often say, “I wish I could take you home with me.” If you’ve had any lessons at all you will know it is much easier to play with someone else. So, through my website, youtube and the power of video, my students can now ‘take me home’. This was the driving force behind BodhranExpert. I am so grateful I get to drum every day. I run the pipe band drumming programs at two private schools in Crieff, Perthshire (Scotland) and love working in a creative environment. Morrison’s Academy http://www.morrisonsacademy.org and Ardvreck School http://www.ardvreckschool.co.uk both have thriving pipe bands and I am proud to teach such enthusiastic youngsters. Drums are so fun that you never have to tell drummers to practice. In fact, you often have to tell them to stop. After twenty-seven years of drumming I feel I have collected advice worthy to others. I try to keep a very open mind to bodhran playing so please take what you find useful to you. There are different styles of playing, but it would be boring if we were all the same. Right? If you become a student of mine I hope that you will eventually take what you’ve learned and make it completely your own. Your musical influences will help you do this without you even realizing it. After years of research, my husband, Mark, and I started our own bodhran manufacturing business. Our Cape Breton Bodhrans have long been recognized for their high quality craftsmanship and sound. Our drums are played throughout Canada, United States, Scotland, Mexico, and Australia. Handcrafted in Sydney Mines, Nova Scotia since 1998, Cape Breton Bodhrans moved with us back to Crieff, Scotland. We would love to continue making professional, tuneable bodhrans and tippers, however, teaching commitments and other projects limit our time in the workshop. Hi! Please can you tell me if you teach privately and if so where you give lessons and the cost. I have had a bodhran collecting dust in my living room for too long! As a Percussive Arts Society member and volunteer, I am extending a hand of friendship to invite you to become a member of the world’s most amazing community of percussionists. I have scoured your website and videos at a blistering pace today and have embraced your style, teaching methods and warm personality. Have you heard of PAS and the PAS convention, PASIC? I attended a bodhran clinic a few years ago and just this past November and my eyes and ears were opened! I found your site and youtube videos in a google search. It would be a pleasure to see you perform and offer a clinic at PASIC soon. If a clinic event next year is not possible, I invite you to be my guest at PASIC as a member and come enjoy the sights and sounds of the most uplifiting percussion event on the planet. I’m wondering if you know any bodhran/percussionists on the West Coast of Canada (Greater Vancouver area) that may wish to work with our Celtic band.